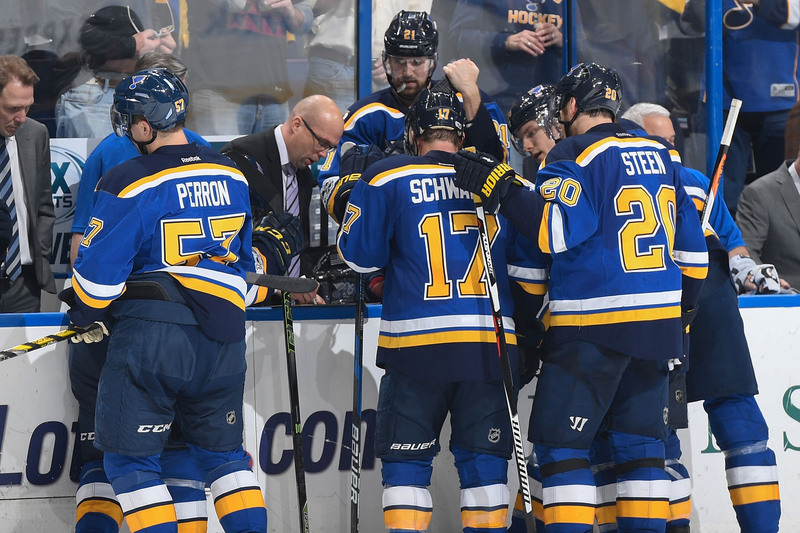 Fixing the St. Louis Blues Powerplay - The Point Data-driven hockey storytelling that gets right to the point. The St. Louis Blues inability to score on the powerplay cost them a playoff spot last season. The Blues, who missed the playoffs by a point, had the 2nd worst powerplay in the NHL and actually had the least productive 5-man unit in the league. Here’s what went wrong and how to fix it. There were 16 five-man powerplay units that played at least 75 minutes together at 5v4 last season. As mentioned, the Blues most used unit of Alex Steen, Brayden Schenn, Jaden Schwartz, Vladimir Tarasenko and Alex Pietrangelo was the worst of the bunch. Below is a table of these most used powerplay groups, their total time together at 5v4 and their goals scored per-20 minutes. In over 80 minutes of 5v4 time together, the Blues top unit scored just 6 times. While the other 15 most used groups scored an average of 3.3 goals per-20 minutes, the Blues top unit was by far the worst averaging less than half that production at 1.5 goals per-20. The Blues loaded up their top unit with their five top scorers and still couldn’t produce. So, what the hell was going on out there? The biggest issue this group faced was the fact that all four forwards are left shots. This limits one-timer options, which is less than ideal when you consider how much better your odds are scoring with this type of shot. Also, Brayden Schenn, one-year removed from leading the league with 17 powerplay goals, was set-up on the right wall, away from the area he did most of that damage (the left side, high-slot). In 80+ minutes with this group at 5v4, he didn’t score once. With the additions of Tyler Bozak, Ryan O’Reilly and David Perron, the Blues will have better options in how they set up at 5v4. As opposed to loading up a unit of left shots like they did last season, a more balanced attack should yield better results. Only one constant should remain from last season’s set-up; Alex Pietrangelo at the point. Tyler Bozak – net-front / pop out guy. Remember that chart above that showed how anemic the Blues most used 5-man unit was? Scroll up and look at the group of players at the top. Bozak was part of the most productive 5-man unit in the NHL last season and he will have a similar role in this set-up. As the Blues net-front option, Bozak, a right shot, will be able to take passes away from the front of the net on his forehand and also be available for backdoor plays when facing the net – as he was in Toronto. He can pop out to either side of the net to create options for the wingers on the walls. Ryan O’Reilly – Bumper guy. O’Reilly is a gifted playmaker who can control the puck and make plays in tight spaces – perfect for this role on the powerplay. Last season, O’Reilly ranked 1st amongst all forwards in offensive zone pass completion rate (88.1%) at 5v4 (min. 400 attempts) and ranked 2nd completing passes into the highly contested slot area (71.9%). Only Claude Giroux was better. Jayden Schwartz – Left wall. Schwartz will move from the bumper spot, now occupied by O’Reilly, to the left wall. However, these two can switch as they please as O’Reilly played the left wall on the Sabres powerplay last season. Familiar territory for both and an effective means of presenting different looks to opposing penalty kills. Schwartz will have plenty of options from the left side – down low to Bozak, up top to Pietrangelo, short pass to O’Reilly and cross ice to the final player on this new and improved unit. Vladimir Tarasenko – Right wall. With the new powerplay set-up, Tarasenko can set up where he should have been all of last season, on his off-wing. Despite playing mainly on the left side the last two seasons, Tarasenko has actually scored nine times from the right circle compared to three from the left. The guy can rip it and this sets up a one-timer option that didn’t exist for the Blues last season. With the right-shot Pietrangelo at the point, there’s a lefty to righty one-timer option there as well (Think Backstrom to Carlson in Washington). Colton Parayko quarterbacks this unit, as he did last season. Alex Steen is the net-front / pop out guy as he was on the first unit last season. David Perron, who played his strong side right wing on Vegas’ powerplay last season, will occupy the same spot on this unit. Brayden Schenn goes back to where he was most effective – the high slot bumper spot on the left side. As mentioned earlier, Schenn played his off-wing and had poor results last season. With this adjusted formation, Schenn returns to the spot where he scored a league leading 17 powerplay goals two seasons ago in Philly. The final piece, Robby Fabbri on his strong side left wing. Fabbri missed all of last season due to injury but the season before, performed well on the Blues powerplay. Fabbri scored 4 times and had 9 points in just under 118 minutes of powerplay time. His shot and vision make him an ideal fit to dictate play from the left side. Patrick Maroon is another new addition who has poweplay experience however, he scored just 1 goal in almost 150 powerplay minutes last season with the Devils and Fabbri brings more to the table as a member of this unit. So, there you have it. The St. Louis Blues new and improved powerplay. Cart these two units out this season and the Blues should have better results with the man-advantage, which should earn them a few more points in the standings.